Tian Meyer will be starting on the wing on Saturday evening when the Toyota Cheetahs host the Dragons in Bloemfontein for the first time in the Guinness Pro14. Meyer comes in on the wing in the place of the William Small-Smith, who was ruled out for six weeks after re-aggravating a knee injury last week during the 31-14 defeat to the Ospreys. While, Shaun Venter, attended the media conference on Tuesday as the teams’ captain, Meyer, will also lead the team onto the park on Saturday. There are no other changes to the backline. The only other change to the team is in the second-row with JP du Preez earning the number five jersey ahead of Sintu Manjezi, who in his turn rotates to the bench. On the bench, Darren Adonis has been named for his second Pro14 cap, ahead of Carel Jan Coetzee who was a late replacement among the reserves a week prior. While both Adonis and Coetzee and even Tapiwe Mafura were considered as favourites to slot in as Small-Smith’s replacement on the right winger, Smith, explained that he wants more experience in the backline. “William is going to be a big loss for us, especially experience wise. The first thing I had a look at was how we could balance out the experience. He was an important voice for us, and another leader in the team. “It is important to have leaders in the team and have guys on the field to manage the game for us. “Bringing in both of those young guys was definitely a point of discussion, but balancing the experience was very important. In the two team’s only previous meeting, the Cheetahs beat the Dragons 29-17 at Rodney Parade in Newport. Saturday evening’s game at the Toyota Stadium kicks off at 19:35. 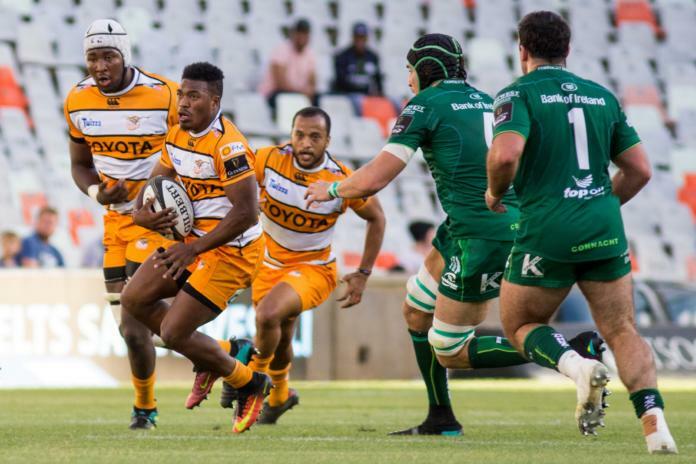 Toyota Cheetahs – 15 Malcolm Jaer, 14 Tian Meyer (captain), 13 Benhard Janse van Rensburg, 12 Dries Swanepoel, 11 Rabz Maxwane, 10 Tian Schoeman, 9 Shaun Venter, 8 Henco Venter, 7 Abongile Nonkontwana, 6 Gerhard Olivier, 5 JP du Preez, 4 Walt Steenkamp, 3 Luan de Bruin, 2 Joseph Dweba, 1 Charles Marais. Replacements – 16 Marnus van der Merwe, 17 Aranos Coetzee, 18 Reinach Venter, 19 Sintu Manjezi, 20 Jasper Wiese, 21 Rudy Paige, 22 Louis Fouché, 23 Darren Adonis. Dragons – 15 Jordan Williams, 14 Zane Kirchner, 13 Adam Warren, 12 Jack Dixon, 11 Hallam Amos, 10 Josh Lewis, 9 Rhodri Williams, 8 Ross Moriarty, 7 Taine Basham, 6 Aaron Wainwright, 5 Lewis Evans, 4 Matthew Speech, 3 Leon Brown, 2 Elliot Dee, 1 Ryan Bevington.